I realize I am so overly biased that my criticism of advertising takeover artists' work isn't very credible. Despite that misfortune, OX never ceases to amaze me and I think it deserves some attention. OX's work breaks all of my self imposed rules over and over again, is subtle and yet not, and is always zigging when I think it will zag. 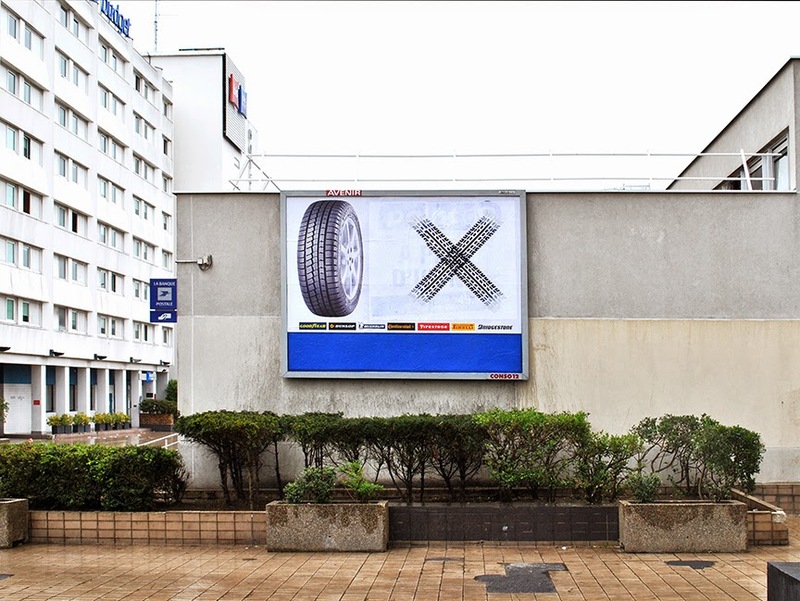 In this recent piece OX includes seven brand names, any one of which would have sent me into a furur in past readings of ad takeover work, either by himself or any other artists. Leaving the brand name is like leaving the ad, not only does it defeat the purpose of doing ad takeover work in the first place, but it subconsciously aligns the brand with a subversive art happening. (OX's choice of tire brands helps to prevent this type of association) All in all though, its a bad look. I'm also not too keen on artists using ad takeovers as an opportunity to promote thier name or brand. Websites and hashtags are an egregious misuse of an opportunity for quality civil disobedience, but using your name can also get tired and make the work about you individually as opposed to public space more generally. I also tend to want ad takeover work to stay away from the use of imagery which could be misconstrued as advertising and therefore passed over by audiences. ( I am getting more lax about this rule in my own work but it is still an important consideration) Noticing an ad takeover has happened is the first step to a dialogue about advertisings place in our shared public environment. My thinking is it is hard enough to get viewers to engage your work in ad spaces, so why make it any more confusing than it has to be. Here OX puts a damn tire in an image that has seven tire manufacturers logos in it. For all intents and purposes this is an advertisement and yet it just isn't. OX turns these shortcomings into advantages by using each infraction for a particular purpose. The use of brand logos, iconography, and his own name only serve to enhance the pieces overall impact, allowing him to get away with the equivalent of ad takeover murder. It is frustrating and wonderful to see OX working so deftly. As mentioned above, the two tire images spell out OX's name, which is a motif he has used in the past, but relatively sparringly, and I never thought it his best work for stated reasons. This use is different. Here OX's name hovers over the seven brand names almost the way a larger throw up might trump all the smaller names underneath it simply by its placement above the others. The names/brands underneath serve to exalt the one name on top and it is important in this context that OX uses logos as these are the names of our commercial public personalities. While this might not be exactly the way name recognition and graffiti hierarchy are actually decided within the community, thats the way it looks to an outsider and I cant help but draw the similarities to what OX is doing here. Using the brand, his name, and finally the iconography of the brands themselves to spell his name, is a complex criticism of who should have power in public space and for a moment a demonstration of what that proper distribution might look like. All in all the work comes off as a deft acrobatic balancing routine in which OX toys with the brand supremacy by conquering them in both size and space, does so by transmuting thier own imagery or product to serve as the medium of his names construction, all while walking a thin line between obvious ad takeover work, and oddly conceived legitimate advertising campaign. Despite my rules, I want to believe that this piece can be seen by the untrained eye, does not serve to reinforce any brand despite the use of thier logos, and does not cross promote those brands by associating subversive art practices with them. I want to believe this because if that is true, to the trained eye this piece is wonderfully complex and yet another proof that art in public space can be a thoughtful and engaging experience in the way advertising never can.